"As a residential and commercial builder for over 35 years, I have worked with hundreds of contractors. 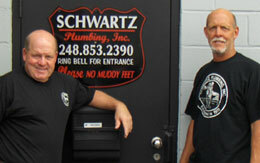 Schwartz Plumbing is, by far, one of the best companies I have ever worked with. They are honest professionals that truly know the plumbing business." Vice President, Ferro Homes, Inc.
...your Southeast Michigan plumbing contractor. Based in Rochester Hills, Michigan, with a crew of 20 seasoned, professional plumbers, we specialize in commercial plumbing and new construction residential plumbing. Our core philosophy is that we're not happy until you're happy. Above all, we believe that treating our customers with a professional, honest, and open attitude ensures that your plumbing job is done to the utmost quality and satisfaction. To learn more about us, please use the links below. We hope you'll consider us for your plumbing needs!